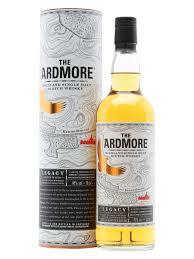 My first experience of Ardmore Legacy when I’ve actually had a bottle to get through rather than the odd dram in a pub. I picked this up because it’s often on “offer” in the supermarkets for around £20 and I have to say for the money it’s well worth it and an after work no hassle sipper it’s highly recommended, my only note here is that the Traditional is 46% and this is 40%, I’ve only tasted the Traditional once but after this bottle I’m going to have to source it for a proper review. On the nose it’s lightly peated, quite sweet, toffee apples, pear, vanilla and cinnamon biscuits. Taste wise we have smoke, baked fruit, pear drop or cola cube sweetness and a nice over all creamy mouthful. The finish is a lingering honey, smoke and heather affair, rather quick but very decent. This is a great entry level peated whisky for anyone who’s wanting this particular style of whisky out, it’s cheap and it’s everywhere too and often on offer. Previous The changing face of whisky, but is it real?